Pages in category "Frankish warriors"
Carloman, was a Frankish king of the Carolingian dynasty. He was the eldest son of Louis the German, king of East Francia and his father appointed him margrave of Pannonia in 856, and upon his fathers death in 876 he became King of Bavaria. He was appointed by King Louis II of Italy as his successor, Carloman only conquered it in 877. In 879 he was incapacitated, perhaps by a stroke, and abdicated Bavaria to Louis the Younger, Carlomans birth date is unknown, but was probably around 830. His naming can be connected to his fathers push to rule Alemannia around the time of his fathers assembly of Worms in 829, the first Carolingian dynast named Carloman had ruled Alemannia in 741–48, and subjugated it to the Franks. Carloman was old enough to participate in the war of 840–43. His first record public appearance is as the leader of an army of reinforcements from Bavaria and Alemannia which he brought to his father at Worms in 842 and he subsequently led them in battle alongside his father and uncle against his other uncle. 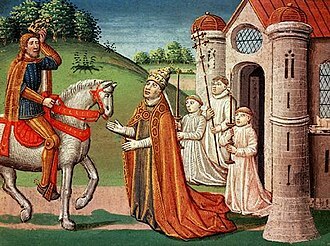 It was the beginning of a warlike career, notker of Saint Gall, who bewailed the decline of the dynasty a generation later, called Carloman bellicosissimus. In October 848, Carloman was present at his fathers council in Regensburg, in the charter confirming the grant, Carloman signed his name first among the secular magnates. In the 840s, Carloman had a liaison with Liutswind, daughter of the Bavarian count Ratolt and this was Carlomans first politically independent action, and it confirms his close connexion to Bavaria. Around 850, Liutswind bore him a son and this name was chosen because it was distinctly dynastic, yet had never been used by a reigning king and was thus appropriate for an illegitimate eldest son. The choice of the name is the surest evidence that Liutswind, in 856, Louis first associated Carloman with his rule by appointing him prefect to the Pannonian March, the Bavarian borderland fronting Great Moravia and Lower Pannonia. He did not give Carloman the traditional seat at Tulln in Pannonia. Conrad I, called the Younger, was the first non-Carolingian king of East Francia from 911 to 918. He was the first elected king of East Francia and the first one to be anointed and he was chosen as the king by the rulers of the East Frankish stem duchies after the death of young king Louis the Child. Prior to this election he had ruled the Duchy of Franconia from 906, Conrad was the son of duke Conrad of Thuringia and his wife Glismut, probably related to Ota, wife of the Carolingian emperor Arnulf of Carinthia and mother of Louis the Child. The Conradines, counts in the Franconian Lahngau region, had been supporters of the Carolingians. At the same time, they competed vigorously for predominance in Franconia with the sons of the Babenbergian duke Henry of Franconia at Bamberg Castle, in 906 the two parties battled each other near Fritzlar. 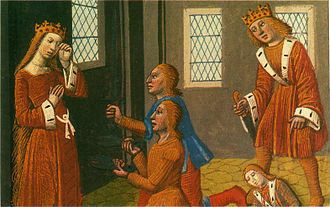 Conrad the Elder was killed, as were two of the three Babenberg brothers, Conrad became the undisputed duke of all Franconia. 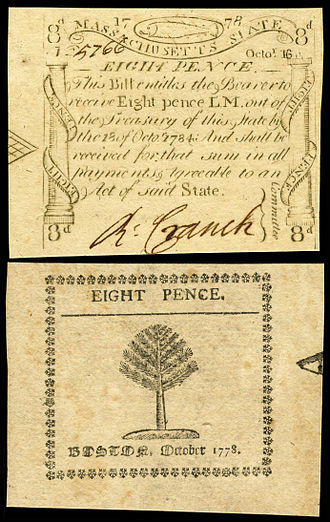 Nevertheless, he failed in his attempts to extend the rule of Conradines over the western Lotharingia after the death of his uncle, duke Gebhard. After the death of Louis the Child, Conrad was elected king of the East Francia on November 10,911 at Forchheim by the rulers of Saxony, the dukes prevented the succession to throne of Louis Carolingian relative Charles the Simple, king of West Francia. They chose the Conradine scion, who was related to the late king. Only Conrads rival, duke of Lotharingia refused to him his allegiance. Exactly because Conrad I was one of the dukes, he found it hard to establish his authority over them. Duke Henry of Saxony was in rebellion against Conrad I until 915 and struggle against Arnulf, Burchard II, Duke of Swabia demanded and received more autonomy. Arnulf of Bavaria called on Magyars for assistance in his uprising, for this he was condemned to death as a traitor, but the powerful duke managed to avoid execution. In 913 Conrad I married the sister of the Swabian count Erchanger, widow of Liutpold and mother of Duke Arnulf of Bavaria, gave him two children and Herman, both born in 913. In 913 Erchanger revolted against Conrad I, in 914 He captured Solomon III, Bishop of Constance, who was Conrad’s chief counselor. Baldwin II was the second margrave of Flanders, ruling from 879 to 918. He was nicknamed the Bald after his grandfather, King Charles the Bald. Baldwin II was born around 865 to Baldwin I of Flanders and Judith of Flanders, the early years of Baldwins rule were marked by a series of devastating Viking raids into Flanders. By 883 CE, he was forced to move north to Pagus Flandransis, Baldwin constructed a series of wooden fortifications at Saint-Omer, Bruges and Kortrijk. He seized lands that were abandoned by royal and ecclesiastical officials, many of these same citadels formed castellanies which housed government and local courts. In 884 CE, Baldwin II married Ælfthryth, the daughter of Alfred the Great, the immediate goal of that Anglo-Flemish alliance was to help Baldwin control the lower Canche River valley. In 888 CE, the western Frankish king, Charles the Fat, was deposed, as a grandson of Charles the Bald, Holy Roman Emperor and King of West Francia, Baldwin could have competed for the crown of West Francia. After Arnulfs birth, Carloman married, before 861, a daughter of that same Count Ernst, who died after 8 August 879. Arnulf kept his seat here and from events it may be inferred that the Carantanians, from an early time, treated him as their own Duke. Later, after he had been crowned King of East Francia, Arnulf turned his old territory of Carinthia into the March of Carinthia, Bavaria was more or less ruled by Arnulf. The division of the realm was confirmed in 880 after Carloman’s death, whenEngelschalk II of Pannonia in 882 rebelled against Aribo, Margrave of Pannonia and ignited the Wilhelminer War, Arnulf supported him and accepted his and his brothers homage. This ruined Arnulfs relationship with his uncle the Emperor and put him at war with Svatopluk of Moravia, Pannonia was invaded, but Arnulf refused to give up the young Wilhelminers. Arnulf did not make peace with Svatopluk until late 885, by which time Moravian ruler was loyal to the emperor, some scholars see this war as destroying Arnulfs hopes at succeeding Charles the Fat. Arnulf took the role in the deposition of his uncle. With the support of the Frankish nobles, Arnulf called a Diet at Tribur and deposed Charles in November 887, having distinguished himself in the war against the Slavs, was elected king by the nobles of East Francia. West Francia, the Kingdom of Burgundy and the Kingdom of Italy at this point elected their own kings from the Carolingian family, like all early Germanic rulers, he was heavily involved in ecclesiastical disputes. Arnulf was fighter, not a negotiator, in 890 he was successfully battling Slavs in Pannonia. 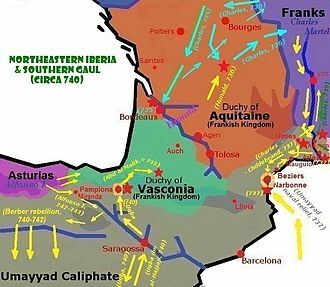 In 891 Danes invaded Lotharingia, and crushed an East Frankish army at Maastricht, at the decisive Battle of Leuven in September 891 in Lotharingia, Arnulf repelled an invasion by the Normans, essentially ending their invasions on that front. The Annales Fuldenses report that the bodies of dead Northmen blocked the run of the river, after this victory Arnulf built a new castle on an island in the Dijle river. Arnulf took advantage of the problems in West Francia after the death of Charles the Fat to secure the territory of Lotharingia, which he converted into a kingdom for his son Zwentibold. Berengar I was the King of Italy from 887, and Holy Roman Emperor after 915, until his death. He is usually known as Berengar of Friuli, since he ruled the March of Friuli from 874 until at least 890, but he had lost control of the region by 896. Berengar rose to one of the most influential laymen in the empire of Charles the Fat. His long reign of 36 years saw him opposed by no less than seven other claimants to the Italian throne and his reign is usually characterised as troubled because of the many competitors for the crown and because of the arrival of Magyar raiders in Western Europe. He was the last emperor before Otto the Great was crowned in 962 and his family was called the Unruochings after his grandfather, Unruoch II. 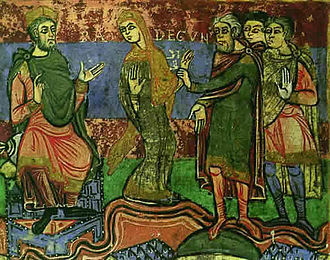 Berengar was a son of Eberhard of Friuli and Gisela, daughter of Louis the Pious and he was thus of Carolingian extraction on his mothers side. He was born probably at Cividale, sometime during his margraviate, he married Bertilla, daughter of Suppo II, thus securing an alliance with the powerful Supponid family. She would rule alongside him as a consors, a title specifically denoting her informal power and influence, as opposed to a mere coniunx, when his older brother Unruoch III died in 874, Berengar succeeded him in the March of Friuli. With this he obtained a key position in the Carolingian Empire, as the march bordered the Croats and he was a territorial magnate with lordship over several counties in northeastern Italy. He was an important channel for the men of Friuli to get access to the emperor and for the emperor to exercise authority in Friuli and he even had a large degree of influence on the church of Friuli. In 884–885, Berengar intervened with the emperor on behalf of Haimo, Louis the German sent first Charles the Fat, his youngest son, and Carloman himself, with armies containing Italian magnates led by Berengar, to possess the Italian kingdom. This was not successful until the death of Charles the Bald in 877, the proximity of Berengars march to Bavaria, which Carloman already ruled under his father, may explain their cooperation. Bernard was the King of the Lombards from 810 to 818. He plotted against his uncle, Emperor Louis the Pious, when the latters Ordinatio Imperii made Bernard a vassal of his cousin Lothair, when his plot was discovered, Louis had him blinded, a procedure which killed him. Bernard was born in 797, the son of King Pepin of Italy. However, there is known about Bernards early childhood. In 810, Pepin died from an illness contracted at a siege of Venice, although Bernard was illegitimate, Bernard married a woman named Cunigunde, but the year of their marriage, and her origins are obscure, spuriously she has been called of Laon. They had one son, Count of Vermandois, who was born in 817, prior to 817, Bernard was a trusted agent of his grandfather Charlemange, and after the old kings death in 814, of his uncle Louis the Pious. A change came in 817, when Louis the Pious drew up an Ordinatio Imperii and this was, it was alleged, the work of the Empress, who wished Bernard to be displaced in favour of her own sons. Resenting Louis actions, Bernard began plotting with a group of magnates, Eggideo and Reginhar, Bernards main complaint was the notion of his being a vassal of Lothair. In practical terms, his position had not been altered at all by the terms of the decree. Nonetheless, partly true reports came to Louis the Pious that his nephew was planning to set up an unlawful – i. e. independent – regime in Italy, Louis the Pious reacted swiftly to the plot, marching south to Chalon. Bernard and his associates were taken by surprise, Bernard travelled to Chalon in an attempt to negotiate terms, but he, Louis had them taken to Aix-la-Chapelle, where they were tried and condemned to death. At the same time, Louis had his half-brothers Drogo and Theoderic tonsured and confined to monasteries and his Kingdom of Italy was reabsorbed into the Frankish empire, and soon after bestowed upon Louis eldest son Lothair. In 822, Louis made a display of public penance at Attigny and these actions possibly stemmed from guilt over his part in Bernards death. When his father was assassinated in 575, Childebert was taken from Paris by Gundobald, one of his faithful lords, to Metz, where he was recognized as sovereign. He was five years old, and during his long minority the power was disputed between his mother Brunhilda and the nobles. Chilperic I, king at Paris, and the Burgundian king Guntram, sought an alliance with Childebert, because Guntram was lord of half of Marseille, the district of Provence became a centre of a brief dispute between the two. 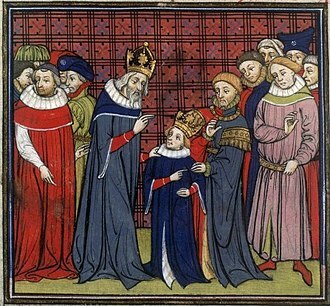 While Jovinus and Theodore, Bishop of Marseille, were travelling to the court of Childebert, meanwhile, blocked Gundulf, a duke of an important senatorial family and Childeberts former domesticus, from entering Marseille on behalf of Childebert. Eventually he was forced to yield, though he arrested Theodore again and had him sent to Guntram, Childebert replaced him in Provence by Nicetius. Despite his revolt, Childebert formally restored Dynamius to favour on 28 November 587, by the Treaty of Andelot of 587, Childebert was recognised as Guntrams heir, and with his uncles help he quelled the revolts of the nobles and succeeded in seizing the castle of Woëwre. A carving of St. Dagobert's murder, from the crypt at Stenay-sur-Meuse. Bronze medallion of King Dagobert II, c.1720. The division of the lands of Gaul to the sons of Clovis I upon his death in 511. Amphitheatre at Trier in which Ascaric and Merogais were executed along with numerous Frankish soldiers. Institution of Baldwin I 'Bras de Fer', the first Margrave of Flanders by Charles the Bald, the Frankish king. Fragment of a fresco at Charlieu Abbey, depicting a humbled Boso left of the Protomartyr Stephen. Late medieval depiction of Hunald surrendering the stronghold of Loches to Pippin. In fact, Pippin took the stronghold but not Hunald.